On this episode of Go Forth And Game, Grant Rodiek and Josh Buergel are my guests. They have a new game called Hocus. It’s a card game with a wizard / fantasy theme. I’ve played a prototype and it’s fun. Josh and Grant are here to talk about it. Tom: Grant and Josh, tell us who you are. Grant: I’m a 31 year old resident of San Francisco. I live here with my fiance, Beth, and my corgi, Peaches. During the day I’m a producer at Maxis. After hours I focus on card and board game designs. My first, Farmageddon, was published in 2012 and won a Parent’s Choice Award. My second, Dawn Sector (name TBD), was signed at the start of 2014 by Portal Games and will hopefully release in 2016. And, I’m planning to publish the card games Hocus and Landfall along with Josh under the Hyperbole Games label in 2015 and 2016. Tom: Ah, the famous Peaches. How is she these days? Grant: She’s quite well! She turned 5 in late January and shows no signs of slowing down. We had a bit of a scare earlier this year when she had a strange bronchial infection, but it’s all cleared up now and she’s able to return to her life of bossing us around. Josh: I’m a 39 year old resident of Seattle. I live with my wife Megan, my kids Madeleine, William, and Marie, and my dog Sampson. During the day, I’m VP of engineering at a small company, small enough that I’m still able to still get down in the weeds with the code. And for my hobby, I’ve been more or less obsessed with hobby gaming since first encountering D&D when I was 7. I’ve designed a handful of games, only one of which is really publicly available, Foresight (on DriveThruCards), and I look forward to getting more of my work out there. Tom: Hocus has been in the works for a while now. Tell us about it. Grant: We’ve been testing and developing and writing about the game since early February of 2014. We hit a mega breakthrough with version 5.0 in late October 2014 and conducted significant blind testing effort around it. We sent copies to about 15 test groups in the US, Canada, and even one in Europe. We’ve also released several iterations via PNP, which you can find here. Josh: It has, honestly, been a struggle at times. There have been times during this past year plus when it never really felt like we were going to crack this nut. An early version we had was fun, people seemed to like it fine, but it was kind of silly, and it had production problems. If we were to try and go forward with that version, it would have cost far more than a lightweight trifle of a game really should have. But getting from there to a game we’re happy with has been tough. Grant: One thing that excites us is that, because this game is a smaller affair (99 cards, box, rules), and we both have well paying day jobs, we can afford to take some risks with the game. 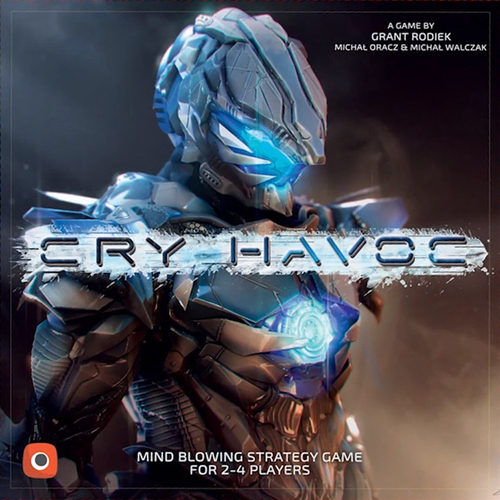 We see Hyperbole Games as a publisher of niche card games. Josh: There is a certain approach we can take to this that we wouldn’t be free to take with others. We can be adventurous with artwork and take a few atypical steps with the funding campaign. I think the people that get into the game are going to love it, but our potential market isn’t necessarily huge. But that’s OK, and it means we can really have fun with the production. Grant: If I may ask, Tom, what do you know about Hocus and what interests you about it? Tom: The thing I like best is that it is familiar but different. Pretty much everyone knows poker. Once you get that and understand the terminology of the game, it is very straight forward. The twist and additions to poker are fun and interesting. I like that everyone has the same Basic Spells so everyone starts out at the same point. But somewhere along the way things diverge as you add Advanced Spells or Owls. The loss of your Owls each round is a nice force to encourage their use. Otherwise I can see hoarding happening. I’m gl ad you foresaw that issue. I like special powers so the Advanced Spells are right up my alley. The theme is appealing to me because I like fantasy. 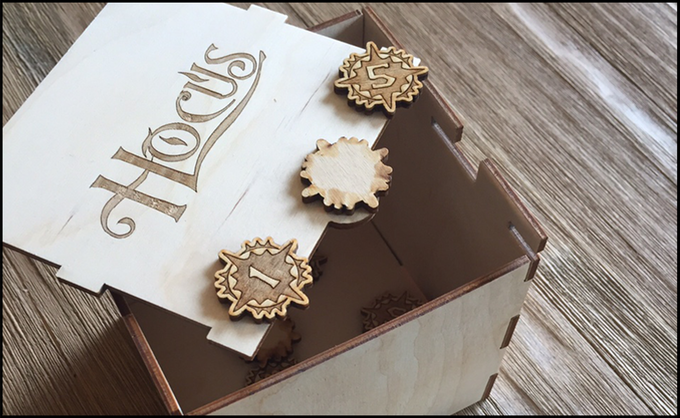 You mentioned in your blog that you flubbed the pitch for Hocus with a publisher at BGG Con. Do you want to talk about that? The Kickstarter is doing fantastic. It’s more than doubled its goal with 19 days to go. Wow! Grant: Sure! I was given a 5 minute audience for an elevator pitch. No full demo or playtest. Version 5 was only a few weeks old and I didn’t have a great pitch or explanation yet. It takes a great deal of practice before you figure out the perfect, question-free way to explain a game. When you’re nervous and ill-prepared, you certainly won’t deliver it. I wasn’t expecting to pitch, so I just wasn’t ready. I felt one of two things were clear based on the very concise rejection input: the publisher just flat wasn’t interested, or the publisher didn’t really get what I was saying. And in both cases, that’s on me. 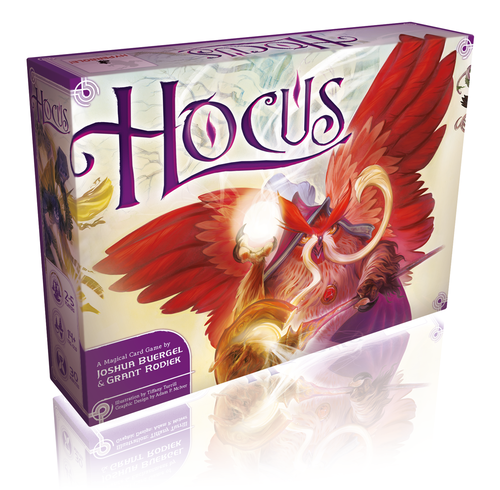 Hocus is a bit of a weird game and many publishers don’t quite have a slot for it in their lineups. This is why Josh and I haven’t been terribly aggressive in finding a home. We think its home is with us. Josh: The area we’re playing in here, which is basically takeoffs on traditional card games, is one that’s near and dear to my heart, but it’s not exactly a proven winner in the marketplace. Grant: Which we’re fine with as publishers. We think we can sell a few thousand copies. Maybe a few more. It’s freeing to be okay with that. Literally minutes after the pitch meeting, Josh and I via email (he was in Seattle) hammered out a better pitch. If you go to the Hocus page of my site, you can see a slightly longer version of what we settled on. I had other phenomenal pitches at BGG. I consider myself a strong demoer and communicator. The difference in Hocus and the other games was preparation. I was nervous, ill-prepared, and I spent the entire 5 minute pitch trying to dig myself out of a hole. If you show up ready, you never get in that position. You’ll still likely get a no, but you’ll look less like a caged animal when you do it. Pitching is fairly straightforward. Find the publisher with whom you want to work. Research to ensure your game is a fit for their catalog. Have a 5 minute pitch, as well as a concise demo/presentation with the prototype. Have a prototype that doesn’t look like it’s been sitting in a gutter. Be ready to answer a wide range of questions. And, stop talking from time to time. Listen and let the publisher think and ask questions. Tom: Thanks for sharing about that and what you learned from it. Listening is a very good advice. It’s hard to do. Josh: I, personally, don’t have a ton of experience with pitching my games. I have self-published before, and I’ve developed games for GMT, but I’ve never really put any effort into pitching a game to a publisher. And given our plans here, I might not get that experience for a while. Grant: I think you’d be fine at it. It’s a communication thing. Assuming the guy or gal on the other end is interested in the notion of your pitch, it’s usually just a good conversation. Josh: I was in debate in high school, I’m good at speaking extemporaneously, I think I’d do fine. But, it’s not really been a huge interest of mine. I’m not somebody who thinks you necessarily need a “real” publisher to validate a game. A game, as a cultural artifact, exists with or without the concerns of commerce. If I’ve designed a game, and I’m happy with it, then it is a thing that exists, an artistic statement. It might be nice to get it in front of more people, but that’s a different concern. Tom: Landfall – I want to know more! Grant: Landfall is a weird idea we had in about March or April, not long after we started working on Hocus. We’re remaining intentionally quiet, which is difficult, as we like to write about our games and processes. Landfall is a series of games with a strong narrative element that are based in a unique science fiction universe. Core to these games, and the experience overall, is surprise from our players. Josh: We’re honestly not trying to be cagey here. As Grant says, we’re both voluble about our work, and I’d love nothing more than to write a weekly 5000 word blog post about how things are going. But, surprise really is central to the conceit here. If Landfall is going to delight people the way we hope it’s going to, it just has to remain pretty close to our vest. Think about the way that Risk: Legacy would have been a different experience if you’d been told about all the stuff inside ahead of time. Landfall isn’t a legacy game, but the same kinds of principles apply. I can say this: it’ll be self-published, all the way. It’s actually really important to our execution of things that we retain complete control of the operation. It’s going to be ambitious, and hopefully unique, but despite that, it’s a very personal project. Grant: We get really giddy talking about it. There are all sorts of neat details outside of the games we hope to do. We’re also really flexing our design muscles here. We’ve essentially created a project where we can experiment with a lot of things. Tom: I want to give your blog some attention. You post excellent content for gamers and game designers. Grant: I’m glad you like it! It’s a humble little operation I’ve been working on for a while. I actually just went to check — the blog turned 3 years old in February of 2015. There are about 300 posts and almost 4000 comments. I’ve tried to evolve the blog and improve the content. In previous years, I would write very specifically about my designs chronologically. But, if you weren’t following along from the beginning, it’d be like jumping into an episode of Lost at Season 3 and expecting to just get it. This past year, I’ve tried to identify interesting topics based on my design work. Then, I write about the topic at a high level, using examples from my own prototypes, as well as more well-known games to which people can relate. I think the blog has improved and the readership has grown some as a result. Another thing I’m proud of are me and Josh’s conversation articles. We basically pick a topic and just discuss it free form. I think they are interesting, read easily, and are funny in parts. We’ve done quite a few of them. Josh: I’ve enjoyed writing those thoroughly. I have a blog that I’ve re-started recently as well, although I’m not nearly as good at putting up content as Grant is. I think that we both just enjoy talking about games. There are constant conversations over email and chat about different games we’ve played, what we think about particular things in the hobby, and really anything game related that comes up. In some ways, I wish we could clean up some more of those conversations and bring them out. Grant: I’ll have to clean up my language. Tom: You can use wingdings -&#^**//##@!!. Josh: Sometimes, our conversations get a bit pungent, in private. It didn’t take long knowing each other before we were already conversing like old friends. I’ve only really known Grant for about a year now, but our plans are already pretty elaborate. Grant: We’re either really clever or delightfully stupid. I’m going to get a trip to Seattle out of this for an EPIC PACKING WEEKEND. Tom, what would you like to see more from my blog? Are there topics or article styles you’d like me to try? Tom: What would I like to see? Hmm. First, I’ll say what I like a lot. I like that you think about the hows and whys of gaming and game design. And then are able to articulate that in a meaningful way. You’re upfront and honest in what you write. You have interesting topics.I like how you ‘introduce’ the point of each paragraph or section at the beginning of each section. Now, suggestions. I’d like to see something on abstracts now and then. I like articles on playtesting a lot since I’m trying to get better at that. Other than that I can’t think of anything. Josh: I hope that this format here proves interesting. I think roundtables are always a lot of fun, and can often be pretty revealing. I enjoy reading interviews, for sure, and having some group interviews might be a fun thing to try out. Tom: I really enjoy the roundtable type of interview a lot. One on one is bread and butter for me. But getting two or three others to bounce things and topics off of lends to more interaction. As has been proven here so far. What advice would you give an aspiring game designer? You are not limited to one topic or suggestion. Grant: I’ve been a professional video game developer for 10 years now and a serious board game developer for over 4 or so. I get frustrated watching folks try to over-analyze or intellectualize the craft of design. I feel folks approach it far too academically. The start for every game designer should be to play and love games. Tons of games. Every type of game. Then, start simple and begin to get a feel for things. My first game was a fairly complex 2ish hour space game that just crumbled under its weight. It had too many systems, took too long to update, and was too confusing to test. I shifted to Farmageddon and learned so much over the following 14 months. Another thing I recommend is to make games you want to play. Make games you love. This is a hobby of passion, not money, and it is one of endurance. I worked for 14 months on Farmageddon before it was published. Dawn Sector turned 3 years old in the spring of 2015 and won’t be out probably until 2016 (I hope!). Sol Rising will turn 2 years old in the spring. Hocus, a simple card game, will have 18 months of development before we finish it. Make games you love and are dying to play. You’ll be stuck with them for a long time, like children. There’s no right way to design. There’s no easy way to do it. Experiment, test often, make something you love, and research by playing other great (and sometimes lousy!) games. Josh: I have a different perspective than a lot of people. I own absolute tons of games, and have played an awful lot. I’ve been playing hobby board games since I was probably about 9. As a consequence, I think that there’s really nothing new under the sun, not really. If you name me most topics and types of games, I’ve probably got a game that more or less fits your criteria. But that’s strangely freeing, to me. It means that I don’t really sit and try and invent something truly, amazingly new. That’s fantastically hard, and really new, innovative things just don’t come along that often. What that means to me is that when I get an idea that I fall in love with, I can chase it, without having the specter of trying to be truly original hanging over me. I’m trying to make games that I love. That pursuit of innovation can be really damaging. You run into doubts, that you aren’t good enough or smart enough to do this. Make a game you love. Don’t worry about how unique it is. Just make it something you adore, and it’ll reflect your personality. You can usually tell when a designer has pursued something out of love. And, as Grant says, play all the time. I have two days every week I game, with a third every other week, and I play games at lunch. Play other people’s games as much as you can, you’ll just get better at recognizing quality and what makes for a great game. And it doesn’t hurt to help other designers out with their designs. Edit rules for them, make suggestions, chip in. It’s how I ended up working with Grant, after all. Grant: That reminds me — that’s a good way to build a relationship with publishers. You can find both of our names in a handful of AAA publishers’ rule books. We volunteer to edit rules and develop and I think that’s an incredible way to build a reputation and get your foot in the door. Josh: It allows you to exercise a critical eye, but with some detachment. You can really dig into how to express rules properly, and what makes good or bad rules, without having any ego tied into the process. My work with GMT followed from rules reviews and playtesting, and my collaboration with Grant came from the same place. It’s a perfect way to get involved and show your ability with relatively low stakes, and it’s great practice. Grant: It’s a little like being a consultant. No final responsibility or accountability. Tom: That’s really cool. More excellent design advice. I recommend helping out other designers too. I try to at least read over rules when they become available. I enjoy playtesting other designers games also though I’m incredibly slow at times. I usually learn something that helps me through this. I have a recommendation for a graphic designer – Daniel Solis. Super talented and even more super guy. Grant: Who? In all seriousness, we’re completely aware of Daniel and his great graphic design work. We chose to work with Adam P. McIver and Tiffany Turrill for a variety of reasons. We loved Tiffany’s distinctive and wonderful illustration style. We thought she could bring our little game to life, and she has. We wanted Adam’s playful and charming iconography, his ability to make great art look even more incredible, and his keen understanding of usability. Also, Adam came to us over a year ago and that really stuck with us. We wanted him to be on the Hocus Team. Josh: There’s really no replacement for enthusiasm about a project. When Adam came to us, it really felt great. Tom: Josh talk about Foresight just a bit. Josh: My pleasure! I learned Bridge when I was 12 or so, self-taught with some friends, and I adored it. I played tons of Bridge all through high school, and it’s how I met my wife. So trick-taking games are in my blood. That stayed in my brain, and then I started playing Uwe Rosenberg’s card games. People know him for his big box games, like Agricola, but I encountered him early in his career, when he was making games like Bohnanza, Bargain Hunt, Mamma Mia, Space Beans, Titus, Klunker, and the like. Grant: Josh was into Uwe before it was cool to be into Uwe. Josh: Yeah, I went there. 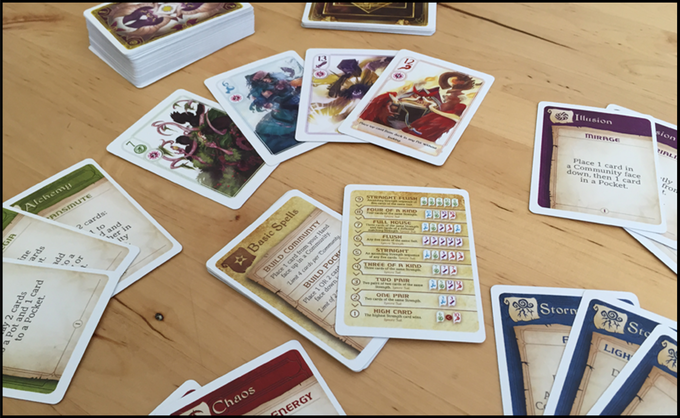 But Uwe really has been my favorite designer ever since I first encountered Bargain Hunt, which is one of my favorite games of all time. I’m delighted to see Uwe get the recognition I think he deserves, but I do kind of wish he’d go back and do some small games again. He’s a monster talent. Anyway, every one of those games does something fascinating with cards, some surprising thing. I decided that I’d like to make a surprising trick taking game of my own. A piece of advice from a James Ernest article a long time ago always stuck with me: games aren’t just the rules that you print, but the shared expectations people have. How turns pass from player to player. How cards are dealt and shuffled. How dice are rolled. That kind of thing. Outside of serious tournament play, that stuff is unspecified. James was asking, what happens if you upset some of those fundamental assertions. I was thinking about cards, and one of the implicit assumptions of cards is that all the backs are the same. But what if they’re not? From there, the idea of making a traditional deck of cards with limited suit information on the back came to me, and that’s what Foresight became. 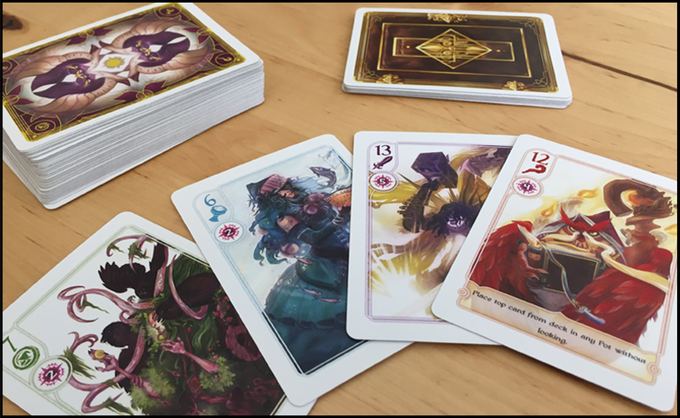 It (Foresight) is a pretty traditional card game in some ways, but there are twists. The deck, of course, is unique (as far as I know). The way you bid is also unique, where you’re really more making bets, not bids. And part of your hand is face down, which provides for some surprising play. I’m pretty proud of it, while recognizing that its market potential is limited. But if you’re into traditional trick-taking games, I think it’s fun. And you can play lots of other games with the deck as well. Grant: Plus it’s only $6! And has really charming art. Your James Earnest comment is really striking. As I note above, when people try to work against academic “laws” and theories about the correct way to design, I get flustered. But, little key insights, or observations that lead you down a path? Those are so fruitful. Tom: Grant, Farmageddon is a big hit in my family. My kids love that game. It has some expansions in the works. Tell us about them. Grant: Sure. Unfortunately, 5th Street Games had to file for bankruptcy in 2015, which has hurt the release of Livestocked and Loaded. My hope is to find a new publisher so that Farmageddon can once again see the light of day. Until then, I’m not really sure what will happen. I think Livestocked and Loaded is a really great addition to the game. I sought to add more strategy and breadth to the experience, as well as fill potential holes from the base game. For example, Sassy Wheat isn’t very often a strong play to plant due to its output. However, with the feed mechanic in Livestocked, they are a far more viable card. I wanted to give more predictability, which is where the Pig’s ability or the Farmer’s Market card come in. I wanted to add some spice for long term players, as well as opportunities for all, hence the weather. The Animals provide an entirely new way to earn money in the game and compete in an interactive way, but it’s not destructive like the base game. This balances out some of that destruction. Tom: There’s an update on the situation here. I’m glad backers are getting the chance to get their hands on the expansions because it is a really fun game. Grant, how is Dawn Sector’s progress? Grant: I think it’s going incredibly well. Portal started developing it in August 2013 when Ignacy took my copy home from Gen Con. In January of 2014, Portal signed the game and I began working closely with the Portal team on development. My partners are incredible. Our first efforts were to add a little more story, strategy, and replayability to the game. We did this with a really simple and clever Event system, by adding map discoveries, by expanding the fort system to be an entire building system, and by adding a few special cards to every deck to allow for more private information and dynamic play. We also enhanced the battle system and have dug deeper to make the factions more unique. I was pretty excited by the game I brought to BGG. The tuning was a bit wonky and it’s too early for us to have perfect text or any graphic design, but the core was strong. Following that, me and Michal re-worked every single event, tactic, faction, discovery token, and deck. They are coming up with brilliant ways to really refine and sharpen the game. I cannot wait for it to be released. Portal is one of my favorite companies by far. Working with them has been a real treat, and Dawn Sector will be 100% better because of their involvement. It could not have been as good without them. Tom: Ok guys we are getting to the end now. A couple of final questions. First, for you both, what do you enjoy doing when you are not in game mode? Josh: I have three young kids, so any time not spent with board games is pretty much spent with them. As a family, we try and get outside as much as we can, with as much hiking and camping as we can get in. Grant: I love to go to the beach with Beth and Peaches, I love to cook for friends, and I love to read science fiction and history. Tom: Next, do you have a favorite cartoon? If so what is it? Josh: Print, that’s Calvin & Hobbes, with an honorable mention to The Far Side. On TV, I think The Simpsons has been hurt by staying too long, and I don’t think anything can touch Futurama’s original run anyway. Grant: The Far Side is by far my favorite print cartoon. As for television, The Simpsons will always be my favorite. Obviously, I just ignore some seasons. Tom: Calvin & Hobbes is THE classic. Last, who would win in a speed eating contest – Albert Einstein or Sir Isaac Newton? Josh: Since I doubt anything is being consumed at relativistic speeds, I’m going to guess Newton here. Grant: If blowing up the food counts as eating it, Mr. Einstein. Tom: Really lastly, how can people communicate with you? Josh: Twitter is the easiest way, @JoshuaBuergel. I have a super guessable email address as well, my first initial and last name at gmail, in case anybody wants to find me that way. Grant: Twitter is great, @HyperboleGrant, as well as email, which is grant at hyperbolegames dot com. Tom: It’s been really fantastic talking to you and watching Hocus develop. I think you have a hit on your hands. Grant: Thanks for the kind words, Tom. It was a real pleasure. Thank you both for spending so much time with me. I had fun learning about you and your games. You both made some very good points about designing games. Readers, you can support Hocus right here. It’s only $15 and has funded so it will be made. It’s a fun and easy to learn game. And if you have a comment leave it by clicking the word balloon at the top or on Twitter using #goforthandgame or @goforthandgame or @tomgurg.